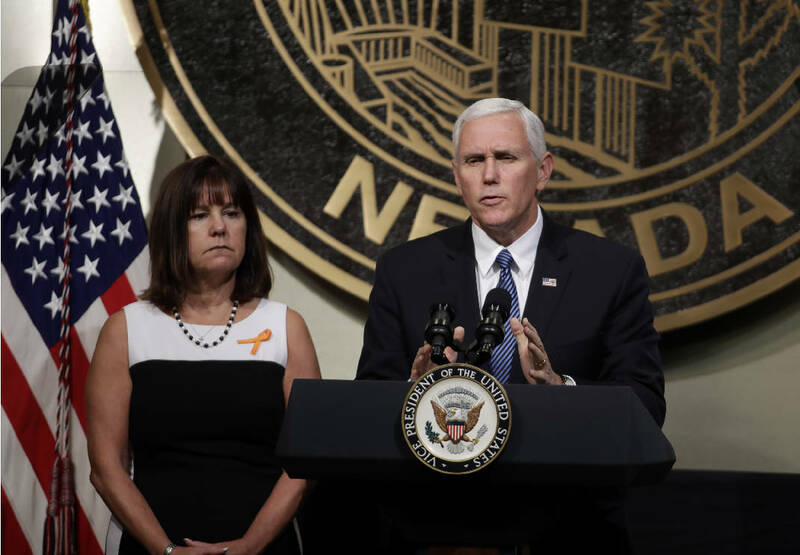 LAS VEGAS (AP) - Vice President Mike Pence praised the heroic response by police and the resolve of the American people at a prayer service in Las Vegas, while federal agents hauled away belongings left behind by terrified concertgoers trying to escape raining bullets from a gunman who was shooting from his high-rise hotel suite. "It was a tragedy of unimaginable proportions," Pence said as he addressed nearly 300 people at Las Vegas City Hall Saturday afternoon. "Those we lost were taken before their time, but their names and their stories will forever be etched into the hearts of the American people." At the same time, federal agents started removing piles of backpacks, baby strollers and lawn chairs still strewn about the site of a country music festival that Stephen Paddock fired upon last Sunday night. Investigators remain stumped about why the reclusive 64-year-old high-stakes video poker player would shoot at the crowd from his 32nd-floor Mandalay Bay hotel room, killing 58 and wounding hundreds before killing himself. The unity service came after dozens of people - many wearing shirts that said "Vegas Strong" - marched from Mandalay Bay to City Hall. After speeches from Pence and other politicians, 58 doves were released into the air, flying in a wide arc and then disappearing into the distance as someone shouted, "God bless America!" Investigators have chased 1,000 leads and examined Paddock's politics, finances, any possible radicalization and his social behavior - typical investigative avenues that have helped uncover the motive in past shootings. But Clark County Undersheriff Kevin McMahill said there's still no clear motive.